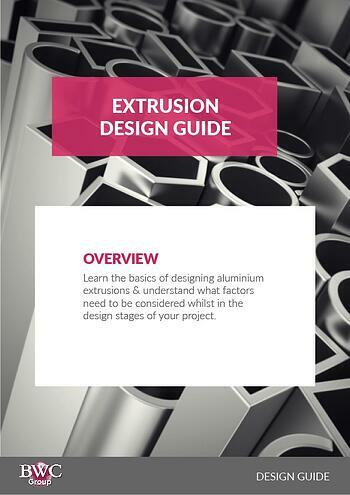 How to calculate the weight of aluminium extrusion? How do you work out how heavy an aluminium extrusion is? The magic number you need is the theoretical weight per meter. Usually expressed in kilos per metre (kg/m). Once you have this you can work out the weight of any length of the profile in question. Cross sectional area is simply the area of a slice of your profile. If you can hark back to your time at school, it's just the ordinary area calculation i.e. length x width (or at least for a simple shape like a square). It's important you use millimeters to work this out if you are going to follow all the steps in this guide. That's the easy part, this is just a square bar after all for more complicated shapes working out the CSA can be tricky. If your profile is made up of lots of smaller squares, rectangles and triangles you could work out the area of each and then add them up to get the Cross Sectional Area. If your shape is more complicated you will probably need to use Computer Aided Design (CAD) software to calculate the area for you. Most packages have simple tools that allow you to retrieve this number. If you are unsure you could always send a sketch to our in house product designer and we could draw it up and work it out for you. This is the easy part, simply take the density of the alloy from the list below. If you can't find the alloy you are looking for or are not sure which to pick try our aluminium alloy page for more information. For a huge range of commercial applications such decorative trims, furniture, mechanical engineering, construction, windows, outdoor structures, etc. the most common alloys are 6060 and 6063. N.B. If you research densities on other websites you will usually find them listed in g/cm cubed, to make our calculation simple we have used kg/cm cubed. All you need to do is divide the number i.e. 2.7 for 6063 by 1000 to give you 0.0027. Data Source: Aluminium Association - International Alloy Designations (p12-22) many hundreds of alloys full chemical compositions and properties can be found in this handy document. Now you have everything you need to work out the weight per metre. 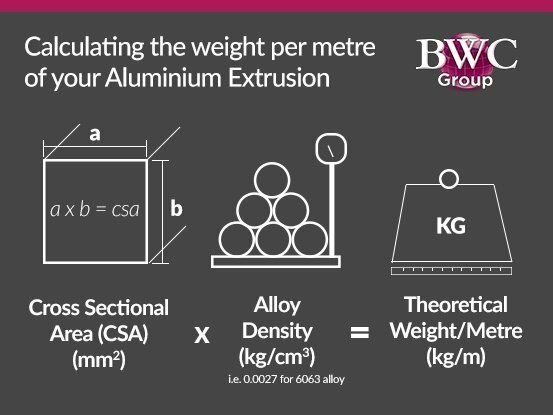 To find out the total weight per unit of your aluminium extrusion simply multiply the kg/m by the length of the finished product. If you found this article useful bookmark this page, share or leave a comment below. Group Development Manager by day, Army Cadet Officer by night. Responsible for breaking new ground and service enhancement. Enjoys building software, learning and trying new things, and challenging outdoor pursuits.